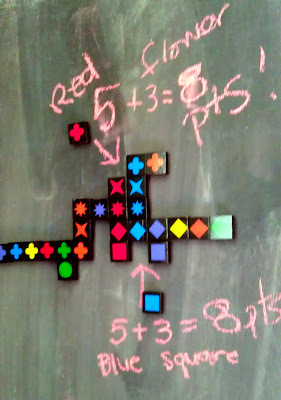 When we talked about Qwirkle, last week, Heather Goldman, PhD, child psychologist, and Psychology Consultant at The Quad Manhattan, told me about how Qwirkle worked on working memory, executive functioning, skills used in crossword puzzles. However, aside from flexibility which I consider a strength in Number 1 (sometimes), I don't understand how he could do so well in a game that practices the skills that he could really be improving. He beats me at this game everytime. I really like using the wall to show how points work. If you think about it, this is a similar angle of a computer screen, something kids look at more often these days. Example of the verbal one? Easy - a word problem in math. Example of the nonverbal one? A good example might be to figure out math patterns with numbers. No words involved. That sounds like Qwirkle to me. Thus, through Qwirkle, I was able to see more how in the verbal realm (classrooms, schools, crossword puzzles, any tasks with words and language), his executive functioning challenges might be more apparent. So now what do I do? Heather says to talk about it when doing something like a crossword together. If you have Qwirkle already, you might have an idea how much smaller the pieces would be. 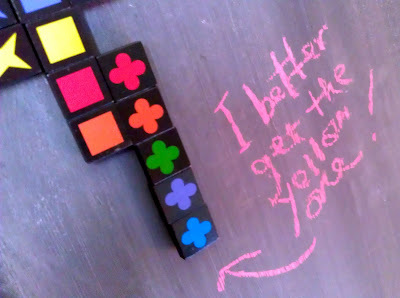 "Even sort of shedding that light where 'Whoa, it’s kind of like Qwirkle,'" said Heather. "This may help him be more open to trying it." Heather says that it depends on the child and the age of the child. "But you know he’ll be able to see the similarities in it and he sees that he really has strengths in these areas." 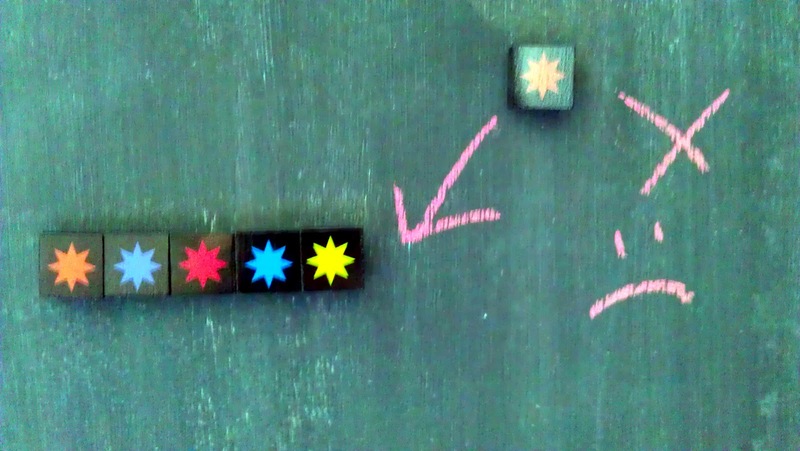 This makes sense, I have been using Qwirkle as an analogy when I talk about solving problems. He is good with analogies. I am hoping he'll understand the way his problem-solving perspectives can be useful, even in places where he doesn't feel as confident (ie. not-so-thrilling lecture, dizzying crossword puzzle). And If You're Not Great at Qwirkle? 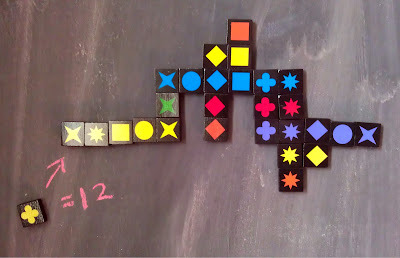 I think it is still worth it to tackle Qwirkle even if you aren't great at it. Not only do you have these friendly shapes on cool black tiles but you also have points to tally and most probably you are not doing a score count after each turn. You just keep making tally marks and you count at the end of the game. The skills picked up while playing, even if you don't win are going to be fruitful for everyone. I love when my kids score points this way. By adding one piece that happens to fit into two lines, they can score multiple points. The whole organizational component is so key," said Heather. "Qwirkle is like a board of problems. There are problems everywhere. Things to solve, things to complete." Heather had a lot of fun playing Qwirkle and she suggested that for those new to the game or needing help, you can play it "open hand" where you do not hide the pieces you have. I did that with Number 2 Son even though he is under the suggested age of 6 and that helped a lot. We also put a cap on the number of points to be won so that he knew we would finish the game faster. This helped him see that he was not half-bad at Qwirkle himself and he started having more fun with the game. 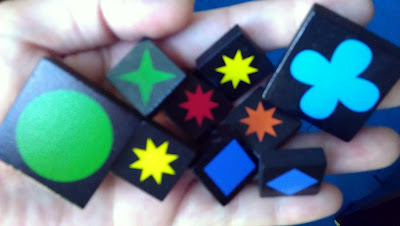 Playing Qwirkle open-hand or playing Qwirkle to pounce on your opponent is equally fun. As both learn and improve with this game, we actually end up feeling pretty proud, especially when they get a Qwirkle right under my nose! I must be getting old. I better play some more Qwirkle which is why I love the travel size. We can take it anywhere and we're definitely using it on our magnetic wall of magic! When your game scenario gets bigger, it's hard to remember which pieces you need and where are the areas to score. Luckily, there is no timer! In case you're wondering..... Toys are Tools has not been compensated in any fashion by the manufacturer or retailer of any of the mentioned products for the publication of this post. 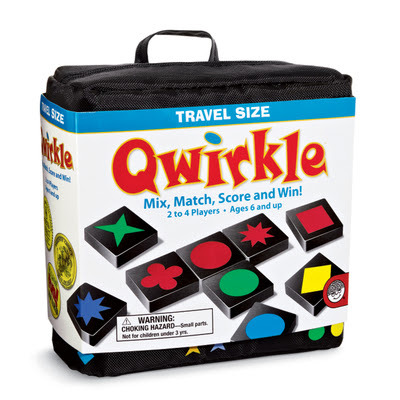 Qwirkle Travel Size edition was submitted to Toys are Tools to facilitate this review. Toys are Tools supplied Dr. Goldman with her review copy of Qwirkle (original). I'm definitely interested in trying this.